Or, 35 and Broadway: That's the uni Lance Broadway turned up in yesterday, in his first appearance with the Mets since being acquired from the White Sox earlier this year for Ramon Castro. Broadway arrived when the Mets noticed something was wrong with Oliver Perez. Broadway is the first Met to suit up in 35 since Bazooka Joe Smith last season. Thanks to reader Glenn who below pointed out Ben Shpigel’s entertaining blog post detailing the news that Bazooka Joe Smith will dress in uni No. 35 and Aaron Sele is also changing — to No. 30 36. ) 30 (I was right all along). The comments illustrate some of the politics of number selections: Rookie Smith is resigned to wear what is offered him; Sele can not only choose his jersey, but (jokingly) request re-numeration for that which he leaves behind. Many thanks to Bob F for the scorecard scan (pictured at right) confirming Dan Frisella wearing No. 29 during his brief stay with the 1969 Mets. A few minor errors have in the meantime been corrected on the roster page: Sherman "Roadblock" Jones' one appearance in No. 28; Kevin Michell's few weeks as No. 35, to name a few -- thanks as always, Jason. Xavier Nady 22 returned from the disabled list on June 18, and Cliff Floyd 30 went onto it, retroactive until June 7 with an ankle sprain. Floyd returned on June 30 as Lastings Milledge 44 returned to Norfolk. These moves came in the midst of a calamitous roadtrip that proved to chew up and ultimately spit out chubby Met hurlers Alay Soler 59 and Heath Bell 19. Soler was replaced July 3 by John Maine 33 -- the next day, Bell was cashiered to Norfolk in exchange for designated clown Jose Lima 17. Seeing as Pedro Martinez 45 is most likely vacationing through the All-Star Break it's likely this week's stretch of games leading to the break could feature Lima... or perhaps, studly young draftee Mike Pelfrey. 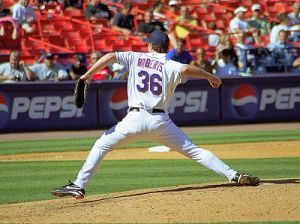 Up the Bannister (March 29): So the Mets yesterday interestingly if somewhat cruelly relegated Aaron Heilman to the bullpen and hope to make a 5th starter out of rookie Brian Bannister. The debate this raises, of course, is whether Bannister ought to also be afforded a dignified uniform number signifying his ascension. Bannister is wearing No. 61 currently. There are historical precedents for any outcome: When Dwight Gooden earned a roster spot in 1984, he went from 64 to 16; but when Eric Valent unexpectedly made the 2004 Mets, he kept his St. Lucified 57. Should Bannister wish to pay tribute to his dad Floyd, a cursory check through the baseball cards reveals he wore Nos. 19 and 38 in his career: Neither is available except in the case Heath Bell fails to make the roster or is traded -- both possibilities we've read in the last week. Perhaps too, numbers don't matter particularly to Bannister: It appears he wore 25 in Binghamton and 43 at Norfolk; 17 with Team USA and oddly, 3 at USC. When Doug Mientkiewicz' attempt to revive his season was interrupted Saturday by a hamstring tear, the Mets fished the Norfolk waters and reeled in fossilized utilityman Jose Offerman. Offernman, just .167 in 36 turns at bat for the Tides, suited up Sunday night in No. 35, recently cashiered by Mike DeJean. Truth be told, the elderly switch-hitting Offerman wasn't that bad as a pinch-hitter for the Twins last year. Willie and the Boz (Feb. 26): Willie Randolph, as quoted by Bill Madden in the Daily News: "I'm gonna wear No. 12. Why? You remember Ken Boswell? Second baseman on the '69 team? He was my favorite player growing up. No. 12. It's a nice number." We remember Ken Boswell too, and even if his sideburns might not fly in Willie's clubhouse, it speaks well of the new Met manager that he has a sense of his place in history. This is probably a natural result of the era we grew up, but 12 has always seemed more Boswellian to us than Kent-like or Alomarish. And as glorified ticket salesman Darryl Strawberry makes a grand reappearance at Shea this weekend, may it serve as a reminder of this team's horribly miscast former manager, who wore No. 18 but was no George Theodore either. We found Madden's piece, by the way, from a link at the extraordinary new blog co-authored by veteran MBTN reader Greg -- highly recommended for fans of good writing and historical Metdom.